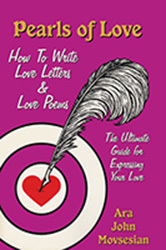 89 Ways to Say "I Love You"
A review of the elements of poetry can help you express your love in a special and unforgettable way. The basic elements presented here will teach you how to write powerful Love Poems that will make a lasting impression on the one you love! Most poetry has rhythm, and rhythm is achieved by emphasizing or deemphasizing certain syllables in the words used in the lines of the love poem. The syllables, themselves, are then grouped into two or three syllable units called "feet". The above feet in brackets are called trochees" because they are each composed of two syllables with the first syllable of each foot emphasized. The above feet in brackets are called "spondees" because they are each composed of two syllables with both syllables of each foot emphasized. The above feet in brackets are called "dactyls" because they are each composed of three syllables with the first syllable of each foot emphasized. The above feet in brackets are called "anapests' because they are each composed of three syllables with the third syllable of each foot emphasized. Rhythm, as you can see from the above, depends on emphasized and deemphasized syllables which make up "feet." Taking this a step further, a "line" or "verse" of a poem is made up of one or more "feet." This verse has four iambic feet. This verse has three iambic feet. The variations are almost endless! Love poetry does not always have to rhyme. For example, there is a type of poetry called "Free Verse." It's almost like prose, except that the words flow with imagery and become poetic in spite of the absence of rhyme. Or caught between the pages Of my mind. Throughout the ages, however, rhymed love poetry has been the prevalent form of this type of expression. And truly I've missed you in countless ways. The couplet is the smallest verse grouping more commonly refered to as a "stanza." a) For the first time, now for the last time seen. b) The lover rooted stays. b) In profuse strains of unpremeditated art. a) But now, proud world! I'm going home. c) What is this world's delight? c) Brief even as bright. a) Thou art a female, Katydid! e) Do Katydids drink tea? b) Has not attained his noon. f) Will go with you along. a) Called a hen a most elegant creature. a) And thus did the hen reward Beecher! (a) Shall I compare thee to a summers day? (g) So long lives this, and this gives life to thee. There are many other variations which we will not discuss at this time.